Today, father and I went to a warehouse today, managed to buy a lot of retail priced cake forms, and cupcake forms and a new grater (I don’t have to improvise anymore! Yes! ), a temporizer that looks like an egg, and pizza forms (? ), a cool range of forms for cookies. I got very excited about my new fighting tools and about my future pizza, bet there were no ingredients for the piua except flour and water. Ah…bummer. l got a huge craving or urge to make lemon cookies. t searched around and made adaptations to lower the fats in the recipe. My doctor said my choresterol was too high perhaps due to abusive cake and soy intake… so please watch out for soy abuse, and tropical oils. ripe I was perplexed because the onlything the recipe had of lemon was the zest (c’amon!). I got excited midway and started mixing in lemon juice, it just kept turning delicious! Just the flavour l had in mind, the one I was furiously craving for. 1. Pre-heat the oven 175°C (345 F). 2. Cream the olive oil, butter and sugar in a large bowl using a spatula or an electric whisk until fluffy. Stir in the vanilla extract. Then add the lemon juice. 3. In a separate bowl combine flour, baking powder and zest. 5. On a clean surface spread the dough and press the cookie form over it; then put then on a baking sheet. Or tear off small amounts of dough, shape into balls spacing them well apart on a baking sheet, as they will spread in the oven. 6. Bake for 15-20 minutes. They will be a bit soft but it will all settle when they cool down a little. You can wait 5 minutes for it to cool down or swallow one no matter how hot is (like I did). 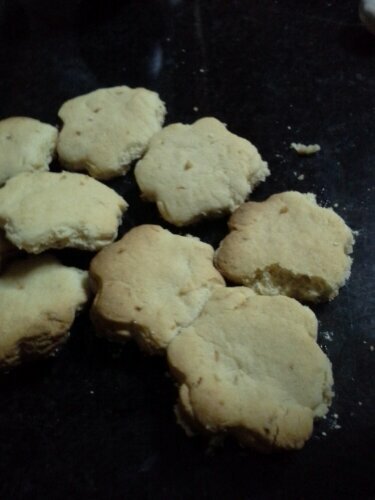 So yummy, why do l bake in the middle of the night? l will be guilty for the extra roundness Of my face! 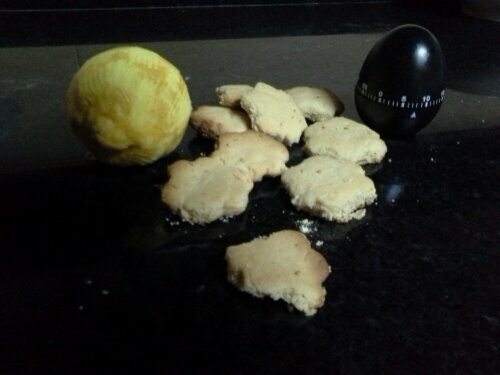 This entry was posted in I want cookies and tagged cookies, Lemon, low choresterol, sugar, Vegan. Bookmark the permalink.